“The presence of various large pharmaceutical vendors with novel therapies in the late stages of clinical trials and a strong pipeline will drive the blood cancer therapeutics market growth in North America. Additionally, the high influx of patients being diagnosed and seeking treatment, encouraged by the increasing number of awareness programs conducted by vendors and various organizations will also drive the growth of the market in North America,” says an analyst at Technavio. 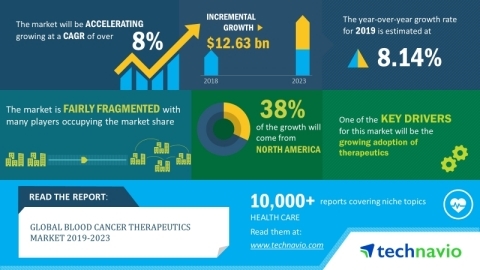 More From BioPortfolio on "Global Blood Cancer Therapeutics Market Will Grow at a CAGR of Over 8% During 2019-2023 | Technavio"